A few days ago, I fell in love with some dazzling upbeat music on the car radio. I had never heard it before. For a few seconds, I felt the trendiest Mum: the car speakers were put to the test and down zipped the car windows as I casually picked up my daughter from collège. Dude. As Julie approached the car she shuddered, begging for a speedy getaway. Mum? ‘One Night in Bangkok’? But that’s ancient! Where was I? 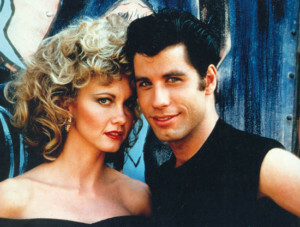 Could we be Sandy and Travolta look-a-likes? Granted, I was not a trendy teenager in the 80s; playing in orchestras and excited by Stravinsky, Brahms or Dvorak rather than discovering Murray Head from Chess in the Charts could be considered downright nerdish. Then again, when Shirley Manson‘s sister (that was cool) asked at choir practice if I’d been to see ‘Grease’, I remember the cringing confusion as I said I’d never been – which was a pity, especially since I adored moussaka. Boom. That was it! After my daughter’s ‘boum‘ before Christmas, it was our turn. 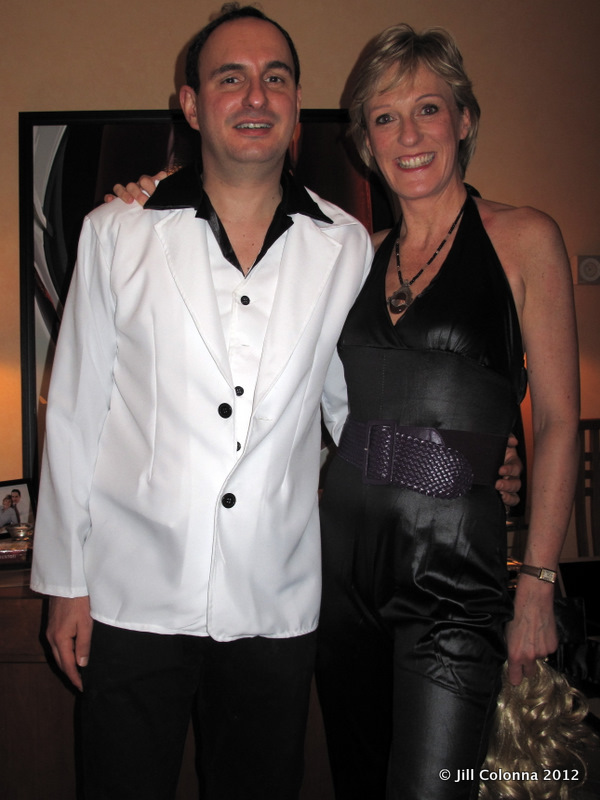 It may have been the end of the festivities of Christmas and New Year but last weekend we discoed back to the 80s. It was time catch up with friends, put on our red shoes and dance away the January blues. One girlfriend took it literally: I’m still in awe how she managed to wear her 20cm-heeled red sparkling Bowie shoes without keeling over. Another friend simply wrapped aluminium foil around his training shoes: great idea! My favourite gear in the 80s was the all-in-one jumpsuit but as it was difficult to pin down again (just as well), I found one quickly on the internet. My John Travolta. Or was it a snazzy barman for the evening? When my brother saw the party wig on Facebook, he thought I’d bought a dog. It wasn’t a dog but whatever it was, it was on top of my head most of the evening and I can tell you that it was sizzling underneath. So sweltering, that I dared take it off later and reveal the soggy dishwater blonde mop underneath. By that time, with the dancing and sweet (why did I want to write that with an ‘a’?) 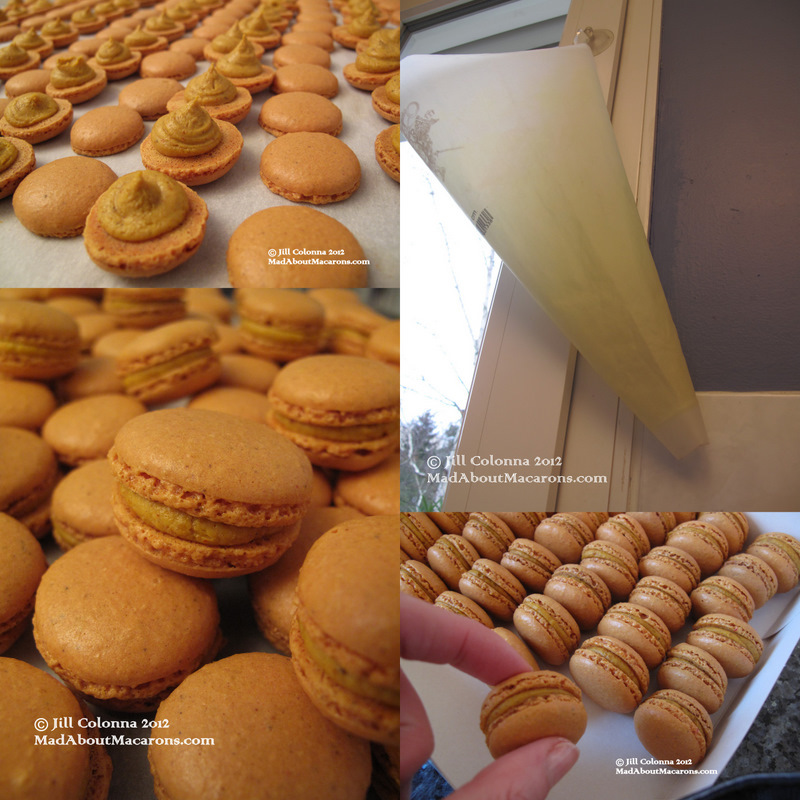 macarons served, who cared? On the 80s food front, apparently microwave popcorn appeared in the USA but hey, we also wanted to serve up chic stuff. So out came my good old favourites with easy recipes to prepare in advance: macarons and mini chocolate-beetroot fondants. On the day: ginger & cardamom panna cottas with rhubarb compôte, plus a huge batch of caramel-orange knitted-looking chouquettes (mini sugared choux buns). We did serve up savouries, though. Try garlic snail toasts for starters, smoked duck and raspberry mini salads, Crab, Ginger & Coriander gluten-free quiches, Macsweens’ Haggis balls with whisky diane sauce … and mini mad macs. Some like their macarons hot! In the 80s, Mum and Dad went exotic with the latest Vespa curry mixes. So, some mini tikka mac’salas were a must to add some 80s pizzazz to hand around with drinks. In making the curry macs (recipe on p.100), I should practise what I preach and done what I suggest in the book: use a disposable piping bag for piping out the curry filling. Now just look what I did: here’s what can happen with a potent curry filling mixing with a not-so-hot piping bag hooked up on the kitchen window (mac hook – it’s handy for drying it quickly.) I completely forgot the fresh coriander for the curry macs, so instead augmented the chili dose; don’t ask me why, but just as well they were tiny since they were hot, man! My camera is not great. 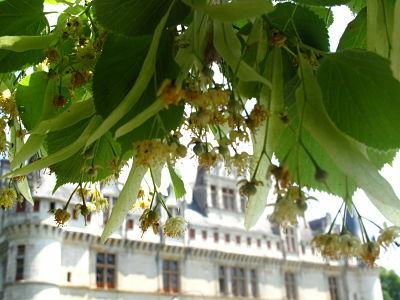 Unless you’re a static macaron and taken in the daylight, a Canon G10 is no use for night time and parties. It’s a crying shame there are no decent photos, since all 30 of us had so much fun dressing up and dancing. Then again, it’s probably for the best that they’re censored! If anyone knows me, I never have any New Year Resolutions but I’m putting in a quest for a new camera, just in case hubby ever reads this. 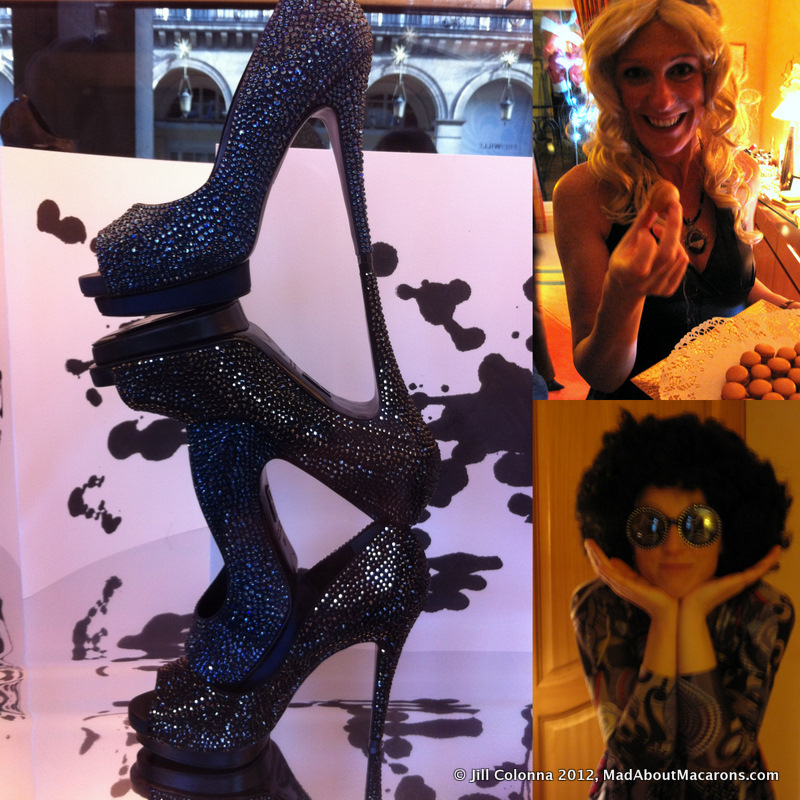 I never bought these shoes near Place Vendôme – just gazed at them – if that helps my case. 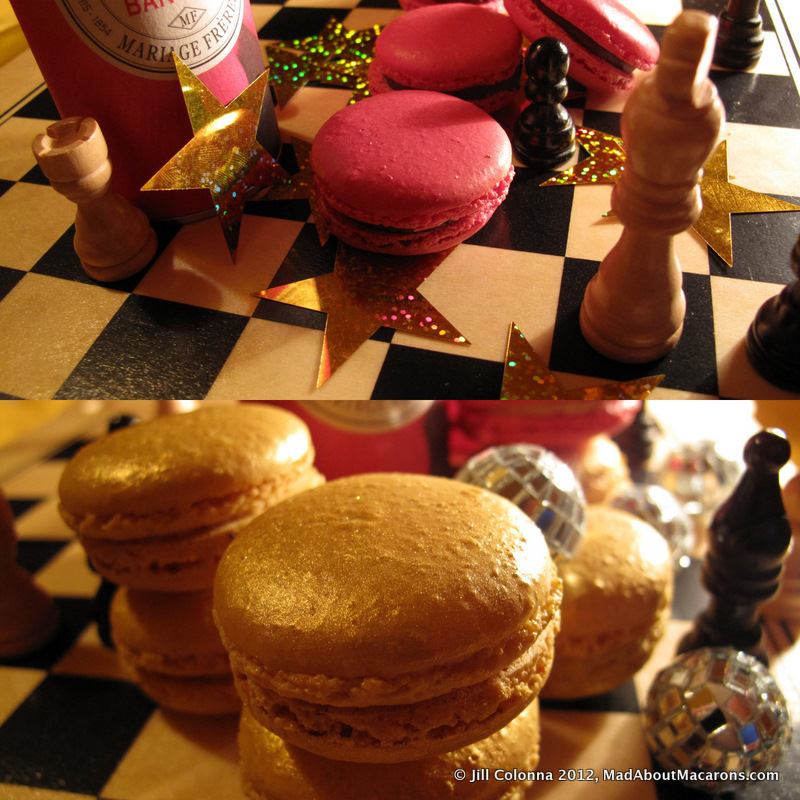 This post is dedicated to MacTweets – as this month the MacAttack #26 Challenge was for Razzle Dazzle Macarons: featuring the Ostentatious with glitzy, dazzling and starry macarons. 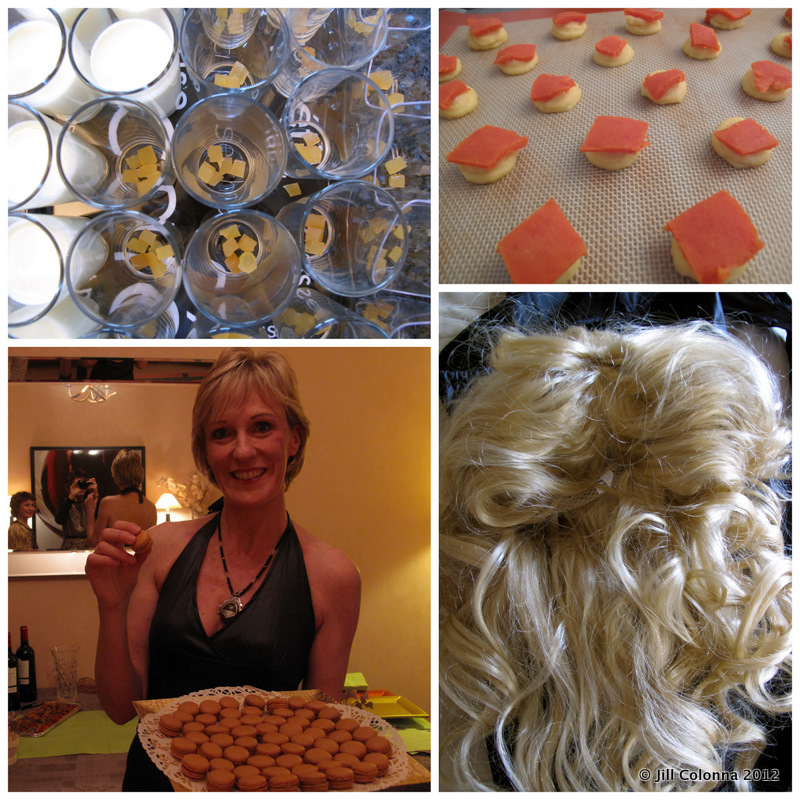 And being MacPassionate (love it, Deeba and Jamie), the party included One Night in Bangkok with some classic Madagascan Vanilla macarons – dusted with gold edible lustre to give it the in every golden cluster look from the Chess 80s musical. For an unexpected twist to dark chocolate macarons, I infused some Paris-Bangkok tea from Mariages Frères in the chocolate. The colour was purely to match the packaging, but I’m sure that it had something to do with the tea’s dazzling hints of red fruits, steamed pudding fragrances, and slight bubble gum tinges. It perhaps wasn’t Bangkok but it was One Night Near Paris and it rocked. I’m already planning the next one. We need more parties to chase away the winter blues, don’t you think? Vive starry nights, great friendships, laughter and loads of fun! 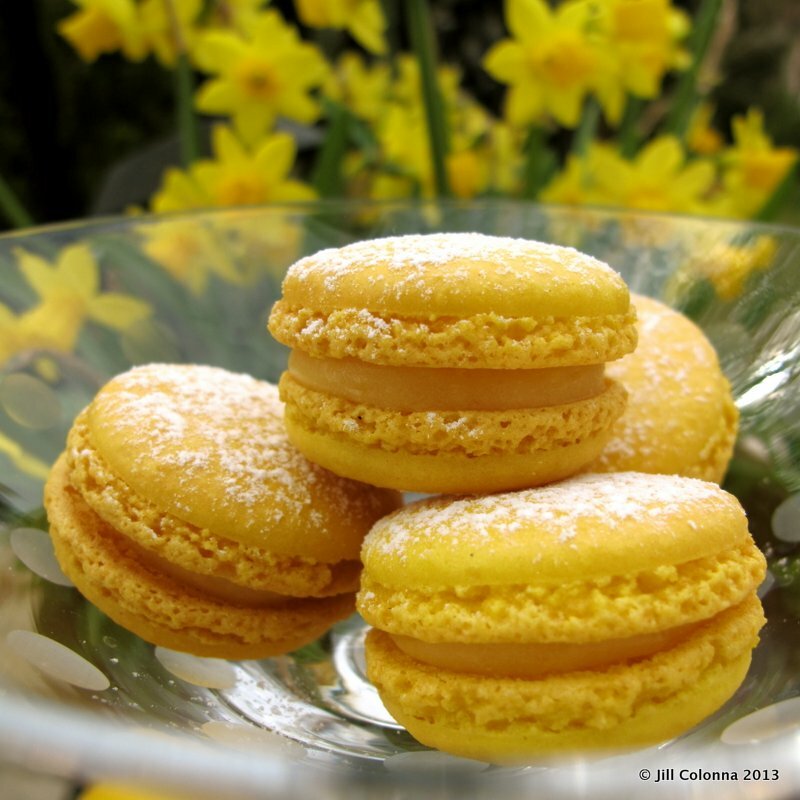 It's Springtime in Paris with Sunny Lemon Macarons! Too bloody funny! I think you look like a cross between Princess Diana and Julie Andrews in that first photo! No, it’s high time we threw another one. 20th wedding anniv and my 50th – but not for another 3 years so perhaps we can start taking the vitamins, lol! Jill Jill Jill… This post has me literally rolling on the floor laughing andnearly spitting out my morning coffee! You are too too funny! I wish you lived closer – so I could be invited to parties like that!!! Oh Jill another triumph “One night in Bangkok” theme night sounded wonderful and the party food (especially the macarons) well what can one say. I think your friends are very lucky to have such a perfect host and hostess who are so fun loving. Hang on to the wig and catsuit Jill you never know when you might need it again. Keep up the good work Jill. My neighbor had a similar 80’s party, and I have to say I was a bit of a party pooper, one of those evenings where I just didn’t want to get dressed up and I ended up coming home early (I’ll blame it on having a cold! ), but some of the people really went all out like you guys did. You would make Olivia NJ jealous with your figure! Wonderful combos with those macs as well… I haven’t made any for a while, I think I need to crack some eggs!! Get cracking on these eggs, Kim. What – you a party pooper? Never. Colds have a lot to answer for but my guess is that you’re too trendy to have any 80s clothes in your closet, hehee. It looks like you had so much fun! I love the jumpsuit! Such a good idea to have a January party, keep those winter blues away! All the party food sounds fantastic. Looks like a great party! Wonderfully done dear! OMG Jill! When I heard about disco party from you I imagined a pretty fun party, but now after the pictures and details, it sounds like you had CRAZY fun partayyyy! Oh you look gorgeous too! Your arm x 2 is my one arm. LOL. You prepared such beautiful desserts and food. You now officially have a party house in town! What a great idea and fun party! You look great Jill and how can you be so skinny with all these macarons you bake every day!! Too sweet, Ivy. But I don’t make them every day. They are still a treat in our house! Irene, it’s our only excuse to keep dancing. Great fun and glad you enjoy it, too! 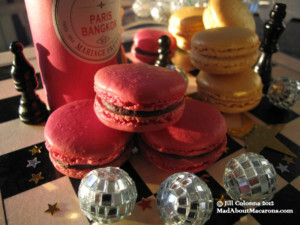 You look fantastic and so do the macarons…the 80’s are coming back around in fashion, so you could be right on the mark. Thanks so much for sharing this very funny post. What a cool idea for a fun party! 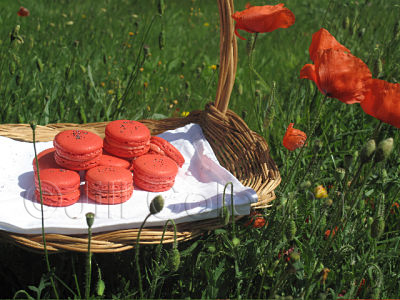 And Of course love the macaroons! Oh girl this makes me love you more than I did already. Love this! You are too sweet, honey bee! That’s the idea, Christy. Boogie these January blues away! Disco macarons–priceless! I think I particularly covet the “One Night in Bangkok” ones. Tehehehe. This is a great post. I love the theme here! Makes me want to dance right in to the kitchen and make some macarons! Hehehe – I’d probably have given the moussaka answer too! 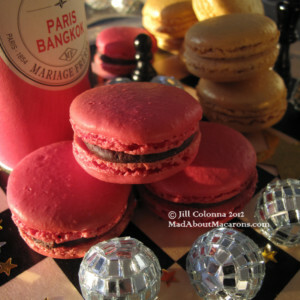 Love the disco-ed up macarons, Jill, and your wig is very Olivia Newton John. Those shoes are amazing, but probably terribly uncomfortable to dance in. Sweet of you, Hester. I’m looking at that wig now scrunched up in a poly bag. Not a pretty sight! Best to look at her lovely pics. What a fun party! I LOVED the 80s! Haha, love it Jill! Sounds like you had a wonderful time at the party even if the wig ended up being removed. The macaroons you made for the occasion sound amazing as usual, and were beautiful judging by the photos! Amy, it helped when other girlfriends took off their wigs too – hairy moments! Great post! I loved Grease (and I was as nerdy as can be). And I loved One Night in Bangkok, not when it first came out, but when I saw Chess in London. I loved it! Aha Beth. You were already far more groovy than I was! I saw Chess and thought it was a Russian-English boardgame competition – dah! 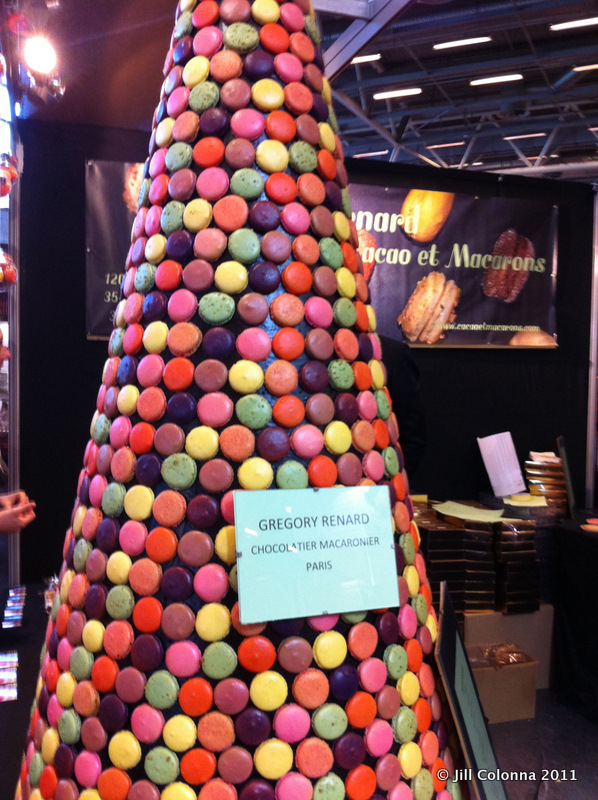 And what a whirling dervish when it comes to macarons flavors!! Who can keep up with your ingenious mind. Wildly creative doesn’t begin to describe..
We missed you – and your glasses, Carol! This post made me smile! The macs sound exotic and fun, and the opportunity to dress in costume for a party is always a great time! I also laughed out loud when you mentioned your limited knowledge of 80s music due to being a classical music person. I’m the same way! I’m always baffled when my non-musician friends can recognize thousands of pop songs after only 1 or 2 seconds of hearing the intro; they even know all the words! And yet somehow *I* am the musical one? :-/ Never understood that! Maia – your comment is music to my ears! Love, love this! I am always amazed at how you can come up with a macaron for every occasion and every decade! I remember the 80’s quite well. Not a great decade for clothes and haircuts, but I lived it up! Great post. Haha, this is the coolest idea ever 🙂 Love the outfits! 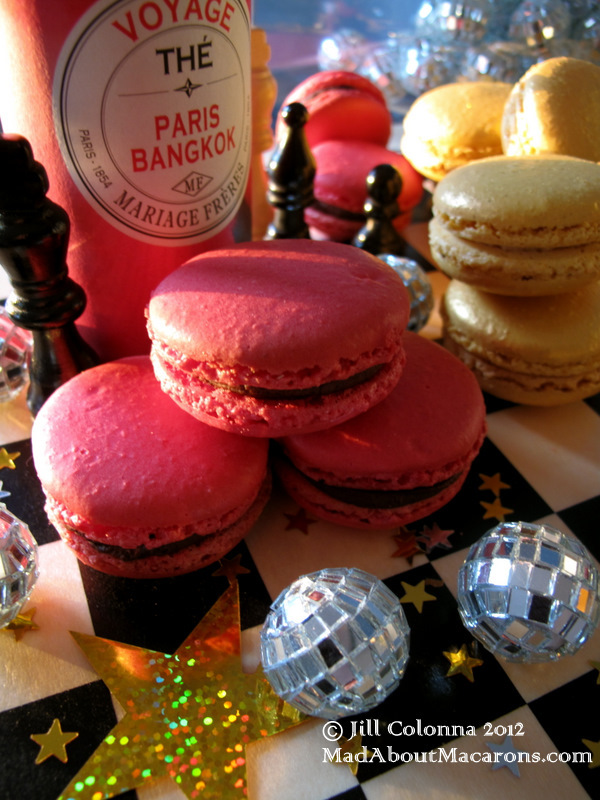 And those are some sparkly, sparkly macarons! Sounds like you had a blast, I would have loved to be there! How 80’s macfabulous! What a fun party. You looked stunning, wig or no wig. Fantastic macarons! Thanks, Lora – love your “macfabulous”! That 80’s party sure does sound like a lot of fun, except for your suffering through wearing that wig! There were some great choices of food as well as your creative macaroons-I especially liked the tea infused ones. Wish I could sample those! Yes, parties are a great way to perk up those dreary winter days when everyone dreads going outside-and it looks like you do have some talent in hosting them. Enjoy the weekend! The trick, Tina, is serving plenty of festive cheer in a glass. Cheers! I LOVE IT!!! Oh man, stunning, the whole thing! I love the wig and the gorgeous jumpsuit and you brought me back to my own teen years (or so). Absolutely brilliant! Always so thrilled to have your creativity as part of our Mactweets party! Keep baking, baby, and let’s boogie (ouch, yeah I had to say that!)!! I love your cue for that dance, Jamie – let’s hit the dancefloor!